The Niger-Congo languages are one of the world's major language families, and Africa's largest in terms of geographical area, number of speakers, and number of distinct languages. They may constitute the world's largest language family in terms of distinct languages, although this question is complicated by ambiguity about what constitutes a distinct language. Most of the most widely spoken indigenous languages of Subsaharan Africa belong to this group. A common property of many Niger-Congo languages is the use of a noun class system. 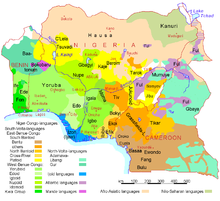 The most widely spoken Niger-Congo languages by native speakers are Yoruba, Igbo, Fula and Shona. The most widely spoken by total number of speakers is Swahili. Subgroups and important single languages of the Niger-Congo family of languages. This page was last changed on 9 March 2015, at 09:00.